(Left to right): RNs Darryl Lemick (CA) and Darla Soles (MD) talk to a resident at one of the dormitory DHS desks. As a team of 28 Red Cross volunteers, they rode in the back of a city dump truck to get to the shelter because of the high waters. Although it was not an easy transport, they arrived safely to prep for the receiving of 5,000 disaster survivors. 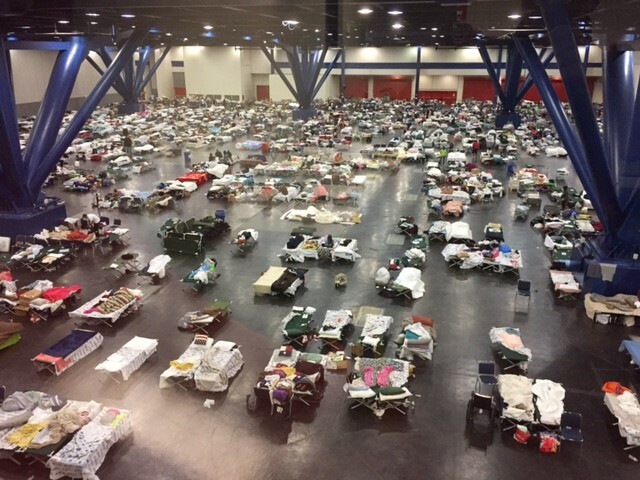 By Sunday evening on August 27th, there were a total of 4,900 people staying there. A shortage of cots and beds began that same night as well. The total increased greatly over night to more than 10,000 people. Carol expressed her gratitude towards the local volunteers because they pitched in their assistance to the team when some Red Cross volunteers were not able to get into the city. Carol’s office views over Dormitory D in the shelter. Another dorm area is set for shelter residents that have pets where they have access to medical services and food supplies from local veterinarians and pet supply retailers. Carol ends with asking for a prayer for the people affected by Hurricane Harvey. We cannot thank her and the rest of the volunteers enough for their support, courage and love for the community. You can still help! 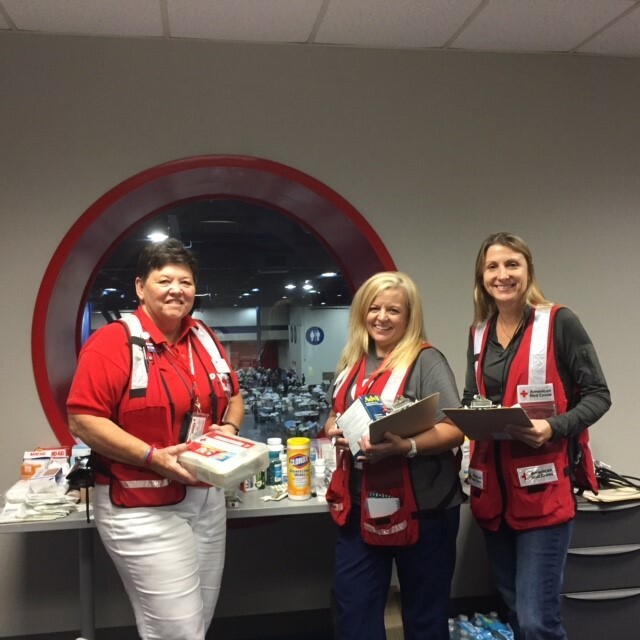 To donate to the Red Cross and learn how your donations are helping those impacted by disaster relief, please visit http://www.redcross.org/news/article/Harvey-Donations-Hard-at-Work-Red-Cross-Efforts-Ongoing. It’s National Fire Safety Week (October 9th-October 15th)! Timing is precious when escaping home fires. You may have as little as 2 minutes to escape. Are you and your family prepared in case of a home fire or know how to prevent them? An essential step is to install the right number of smoke alarms. Test them once a month and replace the batteries at least once a year. You can request for a smoke alarm from the Red Cross at www.getasmokealarm.org. Be sure to know 2 ways to escape from every room of your home and know the family meeting spot outside of your home. A family of 2 share their Red Cross story about the fire that occurred in their California home. As they prepared to leave the American Red Cross shelter at the First Baptist Church in Lake Isabella (CA) when evacuation orders were lifted for the Alta Sierra area, Martin Freerks agreed to one more step. Through a donation from the local Home Depot, the Kern County regional office of the American Red Cross supplied his mom, Marcela, with box fans and air purifiers to ease any respiratory issues upon returning to her hilltop home. In addition, Red Cross shelter volunteers Tom Davis (WI) and Cindy Warner (PA) installed five smoke alarms on 8/27/16 replacing the old ones throughout the two-story house. Volunteers installing smoke alarms on the second floor. During the visit with Martin in late August, area residents still had to show proof of residence, and fire engines were still posted around the property monitoring backfires nearby. It was during his school summer break when Martin caught a glimpse of the glow from the Cedar Fire. He and his mother started packing everything they could in his medium-sized car. “I started moving what was flammable away from the house like the chairs.” He pointed at the “dozer” lines and the melted metal next to the Kern-River-Valley-bleached bones. The house was spared as were trees, rosemary and lemongrass on the property. During their stay at the Red Cross shelter in Lake Isabella, Martin and his mom found a place that was air-conditioned, where they could sleep, shower, have three meals, snacks, and access information via the Internet and wide-screen television. 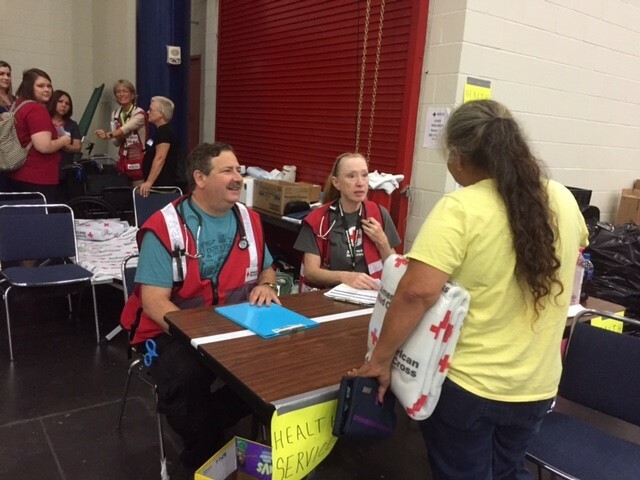 The shelter team included a nurse who would monitor any health issues manifested by the evacuees. Hopefully, as mother and son gather their belongings and get their lives back to normal, the smoke alarms will be another safety step. When Martin returns to start Graduate School in a few months, he will be reassured—and she will be less worried—about the danger of home fires. Be Prepared for a Home Fire – Communication is key! Evacuee Martin Freerks shows workers, Tom Davis and Cindy Warner, the dozer tracks along the perimeter of his property. For more tips, visit www.redcross.org/firesafety. If you’d like to donate and help those recover from home fires, click here.